I think I'm having problems signing in. I gave my secondary email by mistake, and now I can't seem to login under my primary email. The error message when I try to use my primary address says "email is already registered." That would be an issue with discord, as such you'd have to contact them! Though it doesn't really make a difference which email you're using anyway. Oh! Sorry, I thought you were speaking AS discord. Thank you for clarifying. Please create separate sections for Windows 10 and Steam. How can I recognize who plays on each platform? We're going to re-introduce that soon. I think something's wrong. I cant view any messages on the server. ive tried to log in a few times and i get nothing. no messages just a blocked messagebox and a list of people connected. is this normal? A newly introduced feature requires users to read the #rules channel before posting. I can see your reactions now. yeah, thanks pal. trick was i had to ACTUALLY read the rules. silly me. So I have read and reacted to the rules.... still nothing. Discord name is Obscurous. nvr mind i fixed it. 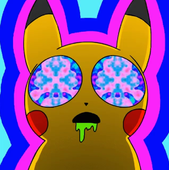 the `reaction" things did not render until now. 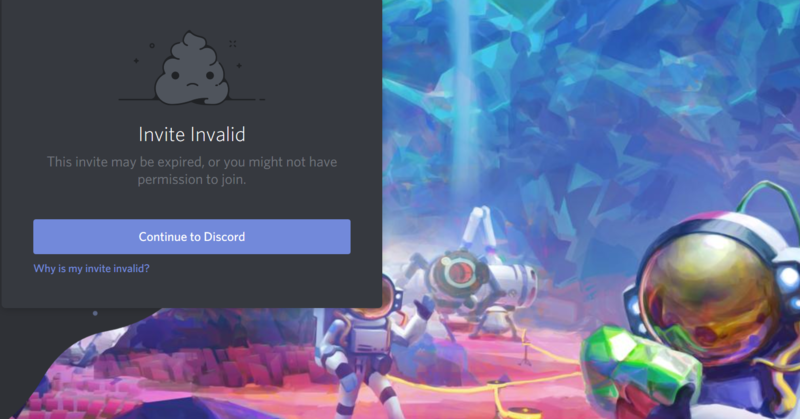 Hey, I was looking to join the Discord server, but when I try to join, it tells me the invite is invalid. According to the Discord site, this can happen if the invite expired, the invite was invalid, I was banned, or I'm already in the max number of servers. I assume I'm not banned, I know I'm not in the max number of servers, and I'm pretty sure the invite code itself is valid because the Astroneer logo and background appear, so I'm thinking something happened and the invite expired or was invalidated somehow. Help would be appreciated! The invite is still perfectly fine. It's possible your IP was banned for some reason. Are you using a VPN? No I am not. I'm not sure how I could've been banned, and nobody else in my household would have joined this server. I suggest to contact the Discord support then, because that kind of issue is outside of my reach. Yeah, means you've been banned from our Discord (I can't find anyone with your name) or your IP has been banned. Since the background picture appears, you know the invite itself is valid. Discord sadly only says the invite is invalid, it doesn't state a reason when there's something else wrong. lol I am 100% sure im not banned since I've never been on the discord in the first place. Maybe you can send this over to the developer or an admin to get sorted? The link is expired. it will still show the background image just invalid. Just an update. I was able to get a working link to the discord. Wasn't banned after all. Interesting. That link is fine. Perhaps it's a browser issue... Glad you solved it, see you there! FYI Wyv is the owner, the devs can do nothing. If the link to the semi-official Discord (here on the forums) is broken for mobile, that should be fixed ASAP. Most people use smart devices as their primary means to access the Internet. This is well established. If you're a veteran player and user of these forums, it makes no sense to go outside these forums and search Google for the Discord address. I was told the address was in the footer (I tune out a lot of pinned topics, we all do) but when I looked it was nowhere to be seen. Afterwards I was told the link was broken for mobile. In other words, the majority of people visiting the forums (who don’t happen upon this thread) won’t find the address. Not good. No excuse for broken mobile links in 2018. Get your webmaster to fix it (or find a better one). Wonder how long it’s been broken?? There's no point in mentioning it here again. It's gonna get fixed eventually (tho forum changes are usually fairly slow). Although I doubt the majority of users actually looks at the footer. Actually I am fairly certain they don't. The link is also in the FAQ btw. It's impossible to miss unless you completely ignore any pinned topics as if they wouldn't exist. I also put it under some of the patch notes as the very first comment. PS: The game links to the forum. Your argument about most people using mobile devices may be right overall (sadly so, hail desktop), but actually has little relevance in this case. You can't play Astroneer on your mobile, and people are likely to end up clicking on the patch notes link in-game, thus automatically getting thrown into the forums, on the desktop version.